Salmon is my favorite fish. Now it wasn't always like this but as I grew older I realized that I needed to expand my food choices and enhance my taste buds :). I have been making salmon for about 6 years (as along as I've been living on my own -- out of my parents' house hehe) and I still have yet to perfect it! I still under or over cook it. Salmon for me is my permanent trial and error dish but I have faith that I will perfect it ONE day :). I am always looking for new salmon recipes. I found this recipe on Pinterest and It was delicious. I recently discovered my love for Panko Bread Crumbs and any time I feel the urge to bread something, I grab Panko! You can never go wrong with Panko OR Salmon! Enjoy!!! 1. Preheat oven to 400 degrees (depending on oven) and spray 13X9 baking dish with nonstick cooking spray. Set aside. 2. In a small bowl whisk together honey, mustard and garlic and a in shallow dish mix together panko bread crumbs, lemon zest and parsley. Drizzle olive oil over mixture and evenly coat. 3. 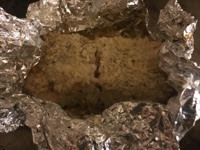 Doing one salmon fillet at a time; brush top of one fillet with honey mixture and season with sea salt and freshly ground black pepper (brush one side at a time). 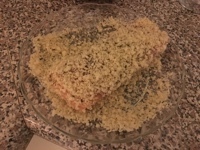 Transfer fillet to panko mix with honey mixture side facing down so the panko bread crumbs and stick. Brush other side with honey mixture and season with sea salt and freshly ground black pepper. Transfer fillet to panko mix and coat that side. Repeat for remaining fillets. 4. Transfer each fillet to baking dish. Bake for 13 to 15 minutes, until salmon fillets are cooked through. You can add a lemon wedge to each fillet if you wish. Enjoy!!! Planning my lunches for the week can sometimes be stressful and quite a chore. But I find when I make a recipe that will last me all 5 days of the week, I am then stress free when it comes to lunches. Simple is always the best way to go for me! When I found this recipe on Pinterest, I was ecstatic :)! All I have to do is fill 3 lettuce wraps the night before and my lunch is made, for the WEEK!!! 1. 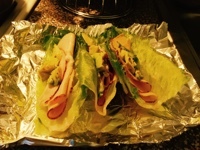 Fill each lettuce cup with deli turkey and/or chicken, 1/2 small avocado and Dijon Mustard. Enjoy!! *I used the other half of the avocado for the second batch. I recently tried Eggplant again because the first time wasn't so good. But I am learning to try new foods for a second time if I didn't like it the first time. That's how I fell in love with Avocadoes. Okay back to my original thought -- this Eggplant recipe is amazing and I love the fact that I give myself a second chance to try new foods. It can be used as a side or a substitute for an unhealthy side. I hope you enjoy this recipe as much as I do! I made twice in one week ;)! 1. Peel, slice and dip slices in beaten egg with a splash of milk and coat on all sides in Panko or Italian Breadcrumbs. Preheat oven to 425 (depending on oven). 2. Place slices in a baking pan, coated and heated with a layer of olive oil. If breakfast is your favorite meal of the day then you will LOVE this recipe. There are so many different variations of this recipe but I decided to make mine simple but delicious! I cannot even tell you how excited I am to wake up in the morning just to eat breakfast. I literally have dreams about what I am going to eat the next morning, haha! My day is defined by breakfast. If I do not have breakfast, I will not be able to function throughout the day and it will be a bad day, no lie! If you are new to having breakfast as a priority in your life, this recipe is a great way to ease the most important meal of the day into your life. This recipe is so simple and easy. It is basically dessert for breakfast but a healthy dessert. Honey and cinnamon are really all I need these days to make something sweet enough for me to enjoy. Did I mention they are both fairly low in calories especially cinnamon!! Cinnamon is known to help reduce belly fat, curb cravings, lower cholesterol and regulate blood sugar levels. Honey is known to boost the immune system, an aid in healing sore throats, good for hangovers and an excellent energy booster. This recipe is sure to convert the non-breakfast eater to someone who cannot wait to wake up the next morning :). 1. Combine all ingredients in mason jar. Let it side over night in fridge. 2. Next day, mix together and enjoy! *You can add fruit as well. I also love adding blueberries when I make it and natural peanut butter the next day once I mix everything together. So good! Hi there! Here is another recipe from one of my favorite websites; damndelicious.net. Don't you love the name?! Everything that I have tried from her website surely is DAMN DELICIOUS. I always love trying new ways with making chicken and when I saw this recipe, it screamed TRY ME, TRY ME!! And that I did and it worked out splendidly :) I even got a compliment from a someone special who is rather hard to please in the kitchen :) Needless to say I patted my back and went to sleep that night with a smile on my face. 1. In a medium saucepan over medium high heat, combine honey, garlic and soy sauce. In a small bowl, combine cornstarch and 1/4 cup water. Stir mixture into the saucepan until thickened, about 1 to 2 minutes; set aside. 2. Heat vegetable oil in a large skillet over medium high heat. 3. In a large bowl, combine flour, thyme, oregano, paprika and cayenne pepper. 4. Season chicken with sea salt and pepper, to taste. 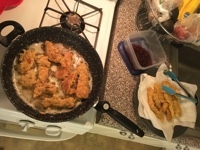 Working one at a time, dredge chicken in chicken in flour mixture, dip into eggs, then dredge in flour mixture again, pressing to coat. 5. Working in batches, add chicken to skillet, 2 or 3 at a time, and cook until evenly golden and crispy, about 3 to 4 minutes on each side. Transfer to a paper towel-lined plate. 6. Serve immediately with honey garlic sauce. Enjoy! !